CPUC President Michael Picker says it’s best to protect the utility from bankruptcy and seeks to use new wildfire legislation to stop it. 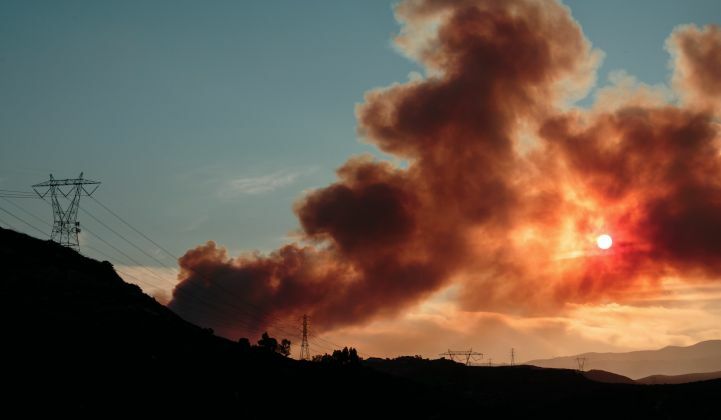 California may protect PG&E from wildfire liabilities. Pacific Gas & Electric’s stock price saw a sharp rebound on Friday, after California’s chief utility regulator told Wall Street analysts that the state would prevent the utility from losing access to funding needed to keep its grid safe and reliable. Picker’s statements seemed to reassure investors that were selling off PG&E shares since the Camp Fire, the state’s deadliest in history, broke out last week. PG&E says it experienced an equipment malfunction near the origin of the fire. Shares rose from $17.75 on Thursday to $25.20 on Friday morning, a 35 percent gain, although still far from the $32 to $33 per share range prior to last week’s selloff. PG&E also managed to keep operating the grid through its previous bankruptcy after the state’s 2001 energy crisis — although at a cost of roughly $10 billion to its customers, and tens of billions of dollars to the state as a whole. But today, PG&E is much more closely intertwined with the state’s ambitious green energy and carbon reduction goals, with billions of dollars in renewable energy procurement, grid modernization and distributed energy integration investment at stake. Despite the stock market rally, PG&E’s exposure to insolvency appeared to grow on Friday, after Moody’s downgraded its credit rating to near-junk status. Moody’s justified the move based on its own estimate that PG&E could face $10 billion in liabilities if it’s found culpable for last year’s massive Tubbs Fire, as well as its exposure to liabilities from the Camp Fire. More than 600 people remain missing since the Camp Fire broke out in the Sierra Nevada foothills last week, with 63 confirmed dead, and more than 6,000 structures destroyed, including the entire town of Paradise. On Friday, PG&E told the CPUC that it “experienced an outage on the Caribou-Palermo 115 kV transmission line in Butte County,” in a location and at a time close to those identified as the “ignition” point of the Camp Fire. Picker also addressed how the CPUC intends to use the state law SB 901, passed in September, to pursue financial remedies for PG&E. The law includes a provision for PG&E to issue bonds to pay for the costs of last year’s wildfires, backed by the ability to raise rates on its customers. SB 901 also provides for the CPUC to put any investor-owned utility through a financial “stress test” when it comes to wildfire liabilities, with the goal of limiting any financial payments to avoid undermining the utility’s ability to reliably and safely operate its grid. Picker told the San Francisco Chronicle that the CPUC would undertake that test after the Camp Fire is controlled. However, the provisions of SB 901 that lay out this approach to balancing wildfire costs through a so-called “reasonableness review” applies to wildfires that occur after January 1, 2019, “which leaves a gap in coverage for the 2018 fires, a credit negative,” Moody’s noted.